In addition to majors and minors in English and writing studies, the English department also houses the WRT 100 and ENG 110 programs. Both WRT 100 (Thinking and Writing) and ENG 110 (Literary Perspectives) are required for all students at Niagara University. We also offer a variety of electives in literature and writing that can fulfill general education requirements. 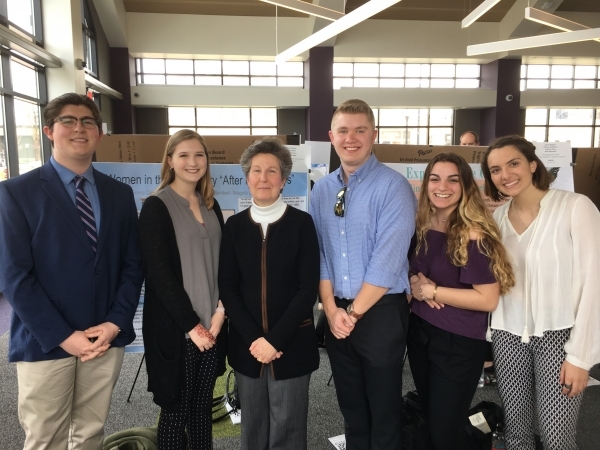 Dr. Kot and some of the participants at the 2018 Undergraduate Research Conference. 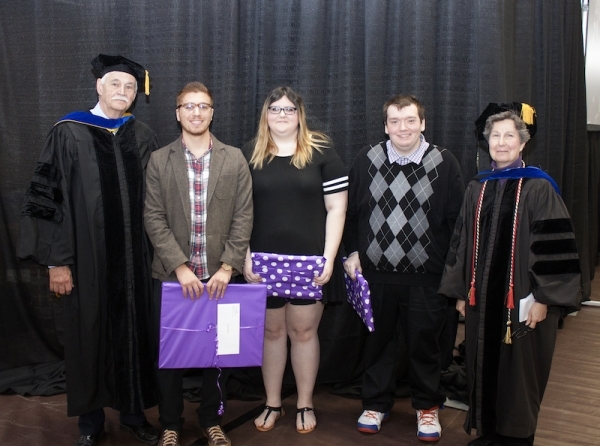 Dr. Martin and Dr. Kot with the English Department award winners at the 2018 Day of Recognition for the College of Arts and Sciences. Sara Anderson receives the 2017 Susan B. Anthony Award. 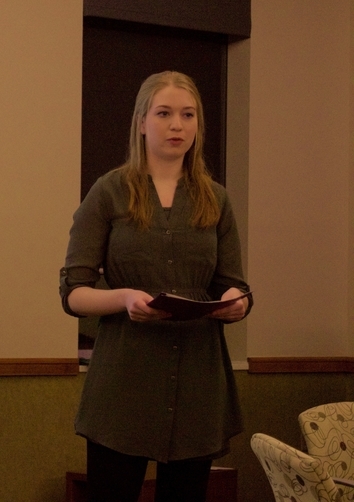 At the 2011 Sigma Tau Delta (English honor society) induction, Dr. Laurel gave an excellent speech about "Why English?" which makes some strong statements about why English is a great choice as a major; then at the fall 2011 induction, Dr. Laurel gave another excellent speech titled "Three Revolutions," which also has some good information about why English is a great choice, even now. Dr. Laurel also has a blog for NU English majors that offers clips and comments from other sources on the Internet specifically for English majors. How can a major or minor in English or minor in writing studies help you now and throughout your career? What does it mean to be an English major/minor or writing studies minor? Do English majors get jobs? There are some common myths about English majors that just aren't true. All you can do with an English degree is become an English teacher! Not true! (However, there's nothing wrong with becoming a teacher!) English majors work in many diverse fields besides education, including: editing and publishing, freelance writing, journalism, library and information science, Web design, business, law, and medicine. English majors often go on to professional school in English (obviously), but also pursue professional degrees in law, business and even medicine. English majors don't get jobs, or they only get jobs that require you to say, "Would you like fries with that?" English courses teach you to read critically and write well. Plenty of employers are eagerly seeking employees with those skills. Also, you can explore careers and make employment connections while still an undergraduate by doing an internship at a local business or organization. You'll even get course credit! Or, check out our English Major Job Help site written by one of our NU majors for lots of resources about possible employment for English majors. English courses are all about reading boring books that have no relevance to your life! Well, if you find books boring, English is probably not the major for you. However, our literature courses are designed to help you understand how other people saw our world through literature and to acquire a variety of critical and theoretical perspectives. Our writing courses teach you about the theoretical, rhetorical, and practical aspects of producing different types of writing such as science writing, ethnography and travel writing, classical rhetoric, editing and publishing and writing for the Web. You have to have perfect grammar and spelling to be an English major! Part of your education should be improving your writing skills and English courses will certainly help you to be a better writer. However, we don't ask that you be perfect when you join us. An English degree won't help me go to law, medical, or any professional school! Plenty of English majors have gone on to law school, medical school, or business school. Advisors can help you choose courses in other fields that mesh well with an English degree and prepare your applications.